We featured this scooter fabric last year and now someone has thankfully gone to the trouble of making it into adorable bedding. But (sigh) it’s not cheap. Prices range from $70.40 (USD) for a cushion to $330 for a Double Quilt Cover or Duvet. And those are sale prices apparently. To see all the sizes available visit this Australian site . Thanks to Cassie M. for this find! 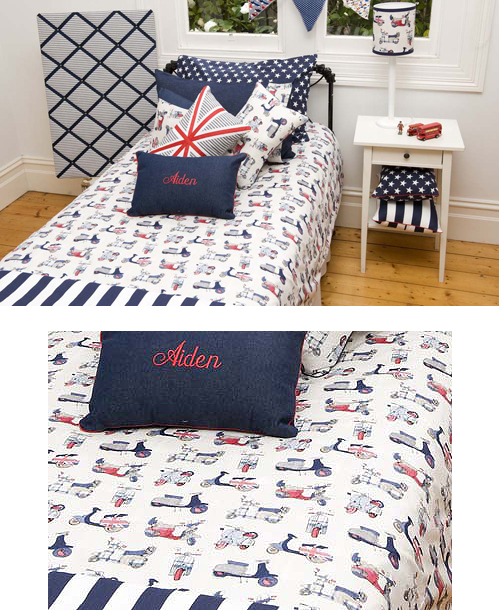 This entry was posted in Decor, Fabric and tagged bedding, boys, british, comforter, duvet, kids, lambretta, lullaby linen, pillows, scooter, sheets, throw, union jack, vespa by Tracy. Bookmark the permalink.